The DELI Line is our most aggressively priced container line. 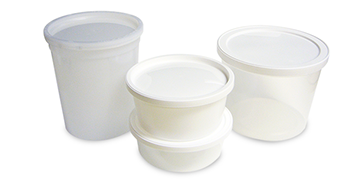 benefits truly make DELI Line containers a cost-effective choice. or by using shrink bands or film seals. 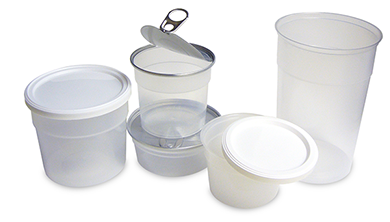 Flat or recessed lids are also an available option. The DELI Line is currently being used for products such as: Guacamole, Salsas, Salads, Dips, Spreads, Soups, Sauces, etc. Sizes range from 7 oz. to 48 oz. capacities. Currently available are over 11 sizes in Clear Polypropylene and four sizes in White or Natural High Density Polyethylene. aluminum, steel, and composite cans. product tampering, while remaining user-friendly for the consumer. as well as Custom Colors. 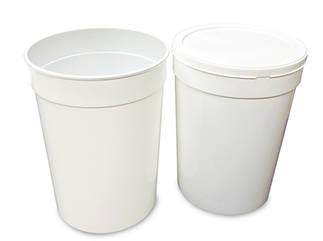 PPF Polypropylene model lids are available in White or Clear. a liquid and air tight seal at the seam. semi-automatic, and high speed canning equipment. Soups, Sauces, etc. All sizes are available in either Clear or Natural, depending on the item. model lid, and one that is used with a “604” model lid.